The Bears season is best expressed by a poster of a three-year-old wearing a Bears sweater and flipping the bird in this conversation-friendly oasis in Rogers Park. Swinging saloon doors open into a vast room where a miniature Dale Earnhardt Jr. No. 8 car revolves in a slow orbit over the Formica bar, and pretzel rods in big bowls on the bar beckon the adventurous. Tuck a pint, grab a pack of cigs to go and walk a block or so to Giordano's to pick up your nightcap pizza. El stop: Red to Morse. Bus: 147, 155, 96. 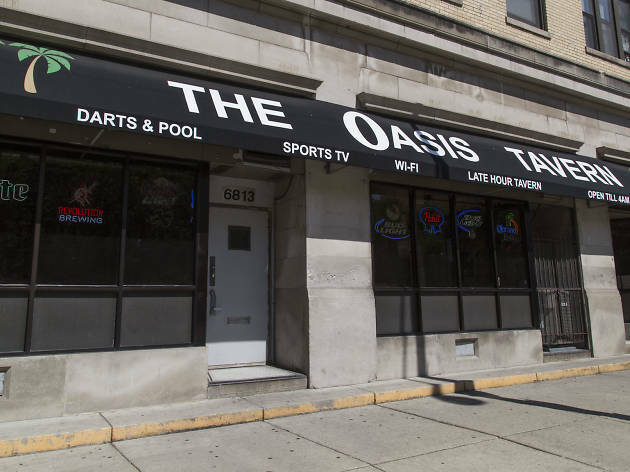 Look, there's nothing fancy about this place (though it does offer an unexpected range of craft beers on tap that belies the bar's general Bud Light aesthetic). 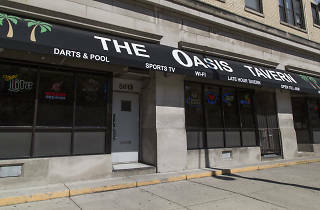 But the Oasis lives up to its name as a friendly, if slightly shabby, refuge for Rogers Park residents of all stripes.